Luxury home prices rose 7.9 percent in the first quarter of 2018 compared to last year, to an average of $1.8 million. This analysis tracks home sales in more than 1,000 cities across the country and defines a home as luxury if it is among the top 5 percent most expensive homes sold in the city in each quarter. The average price for the bottom 95 percent of homes was $330,000, up 7.5 percent compared to a year earlier. The strong price growth for luxury homes is due to decline in supply that has persisted since the second quarter of 2017. The number of homes for sale priced at or above $1 million fell 20.4 percent in the first quarter compared to a year earlier, while the number of homes priced at or above $5 million dropped 19.2 percent. The inventory shortage in the luxury market is newer and somewhat less severe than the inventory shortage for more affordable homes. The number of homes for sale priced below $1 million has been in decline since the third quarter of 2015 and fell 22.8 percent in the first quarter compared to last year. Competition for luxury homes is also escalating. The average luxury home that sold last quarter went under contract after 82 days on the market, nine days faster than the same period last year. While only 1.5 percent of luxury homes were bid up over the asking price, that’s up from 1.3 percent in the first quarter of 2017. “For the first time since changes to the tax code went into effect, luxury buyers could no longer deduct more than $10,000 in state and local property taxes or interest for mortgages over $750,000. In a world of balanced supply and demand these changes would have dampened price growth. 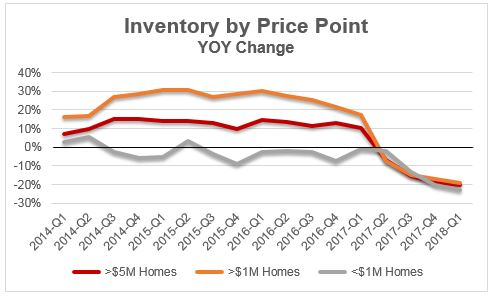 Instead, this quarter saw the strongest luxury price appreciation in four years, demonstrating that the current inventory crunch is extremely broad-based and affects buyers at every price range,” said Redfin chief economist Nela Richardson. Several cities in Florida and Nevada saw strong luxury price growth in the first quarter. In Vero Beach, Florida, the average sale price for a luxury home soared 68 percent over last year to $2.65 million, while the rest of the market saw strong, but less eye-popping, growth of 7.9 percent. The early January sale of this $17.5 million property likely played a role in driving up the average sale price in Vero Beach . Luxury home prices were up 51.3 percent in Reno, 26 percent in Las Vegas and 22.4 percent in Henderson, a Vegas suburb. The average price for a luxury home fell furthest in Long Beach, California, down 26.1 percent year over year last quarter. Prices for high-end properties also fell in Washington, D.C. (-9.6%), Fort Lauderdale (-7.3%) and Clearwater (-4.5%). 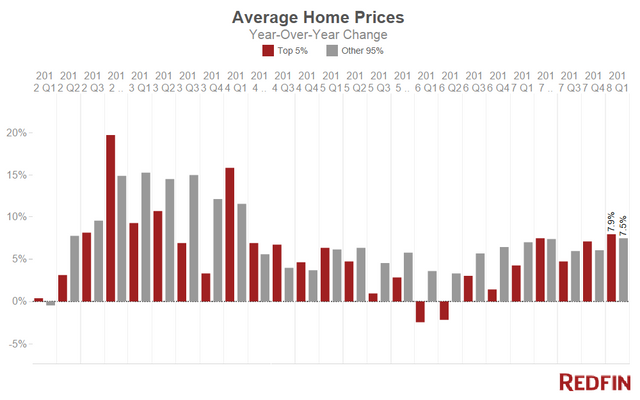 Among the markets where luxury home sale prices declined, only Washington, D.C. saw prices in the rest of the market also fall, down half a percent. This lush property on the Atlantic in Palm Beach sold for 39.4 million. It features a stunning main house, four-bedroom guest house and cabana. Walnut Place, an historic Texas estate that has hosted Presidents and dignitaries, sold at auction for $39.2 million. The stunning home sits on 25 acres of manicured lawns and gardens. This $38 million beachfront home in Malibu is all about the ocean views and indoor/outdoor living spaces. Situated on nine acres with sweeping vistas of the mountains and the Pacific, this Montecito home sold for $35 million. Don’t miss the spectacular wine cellar. Owned by David Rockefeller, this grand, $33 million estate on the Hudson River includes a horse stable, carriage house, orchards and manicured lawns. Sold for $27.5 million, this Kona Island retreat is located in the exclusive Kukio Golf and Beach Club community. Redfin represented the buyer who purchased this gorgeous $26.75 million property on Lake Washington in Seattle. The tudor-style home offers tiered English gardens and stunning views of Mount Rainier. This contemporary retreat sits on a private beach in Delray Beach, Florida. It sold for $26.8 million. Declared the “Crown Jewel of Brentwood Park” in the listing remarks, this gated estate in West Los Angeles sold for $26 million. This newly-built, 11,000 square foot home in Manalapan, Florida sits on plot along Ocean Boulevard that offers both ocean and lake access. It sold for $24 million. Methodology: Redfin tracks the most expensive 5 percent of homes sold in more than 1,000 U.S. cities and compares price changes to the bottom 95 percent of homes in those cities. Analysis is based on multiple-listing and county recorder sales data in markets served by Redfin. To determine luxury market winners and losers, we looked at cities with at least 40 luxury sales in the quarter and an average luxury sale price of $1 million or higher.